Tickle My Senses: Simple Hot and Spicy Beef Curry! The Express Way! This is another Express recipe I developed when I wasnt in the mood for the laborious intricacies..roasting /grinding and frying..etc....etc..... if you like one pot and non- fuss wonders this recipe is for you, will save you lots of time .....simply toss in all the ingredients into a pot and let it cook slowly allowing the meat to become tender and take in all those lovely spices and flavours. In the UK, beef tends to be very tender, hence I rarely use a pressure cooker, unlike back home where the meat has to be pressure cooked to get it soft. Hence if you do have to use a pressure cooker follow the below recipe and cook it to your liking. I like the gravy slightly thick. Serve hot with boiled rice or parathas. 1. Take all the ingredients in a wide bottomed vessel add 1/2 to 3/4 cup water. Cook on a slow- medium flame till done( around 30- 45 minutes) Stirring in between. Check for salt. I like the gravy thick so allow the gravy to dry up and thicken once the meat is cooked(you can add/ reduce water to alter the gravy consistency) 2. Garnish with chopped coriander leaves and serve with boiled rice. 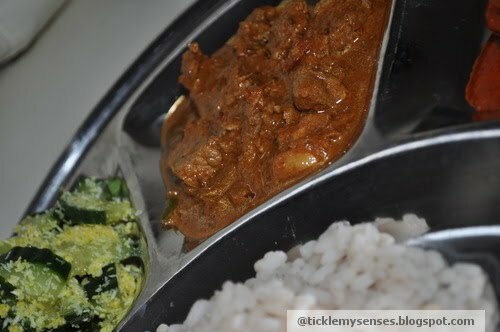 hey Carol, Made your hot and spicy beef curry from 'Tickle my senses'. Big hit with my family. Thanks for sharing. Hey Miss Marlene....thankyou! !...........you made my day for trying it out and letting me know........im sooo happy you liked it!!! 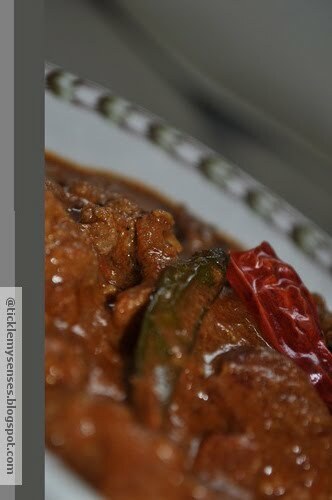 Carol tried your spicy beef curry recipe, came uot real good.....hubby enjoyed it too, thanks for posting it. chethu....thankyou for trying!! so happppy you liked it! !